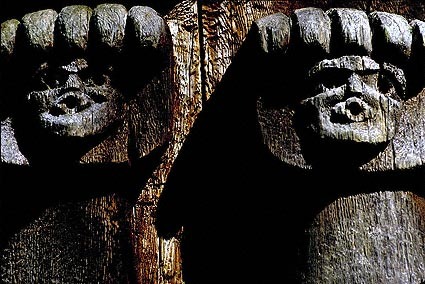 I'm interested here in the faces in the bear paws, they're quite similar to the one created by the tree leaves in the Linda Tellington-Jones photograph. It has been mentioned to me that the bear paw faces are a classic representation of a shaman in trance. While I may have felt the energy that way at differing times in my life, I didn't know this about the imagery directly myself. I do know that if you spend time with Linda around animals, you will feel and notice her effect on them. This totem pole stands at a decaying, abandoned homesite located on a small un-named island along Canada's Inside Passage.